Flagstones are all 40mm thick. They are laid on a topping of cement and sand and fixed with cement slurry. The topping is approximately 30mm thick. It is not necessary for them to have a concrete base or slab. Grouting lines are approximately 10-12 mm. 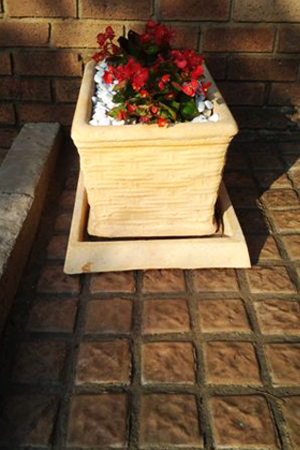 The colour of the grout can either be a traditional gray or colour coded to match the Flagstones. Lacotta Flagstones are cement based, and are porous. It is recommended that a sealer coat be applied, to protect the tiles. Generally a 5-year period is expected before stripping and resealing is required. This process can be repeated where and when needed making the Lacotta Flagstone timeless. As with all Lacotta products, Lacotta flagstones are handmade.